I reckon there should be a 21st century addition to the family etiquette handbook banning laptops at the breakfast table. It’s anti-social and indeed downright rude: at best you get to your emails ten minutes quicker but it’s also really stupid because computers do not thrive on a diet of milkdrops, cornflake fragments and bits of toast. I never appear without mine – and with it I bring another potential, disgraceful side-effect, manifested in our household on the second day of the New Year when, a few minutes after I’d sat down, booted up and started munching, the air gradually began to turn blue. “Oh dear” muttered youngest son: “he’s on to the science pages of the broadsheets: fingers in ears.” How shrewd. And what good advice. So what was it that so wound me up when I was looking forward to a rather non-sciency, tranquil opening to the year? 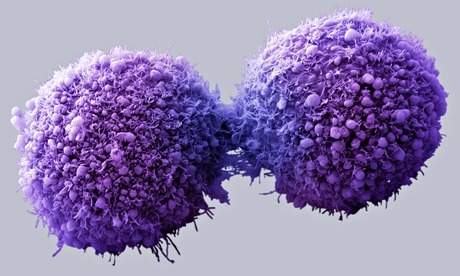 “Most cancers are caused by bad luck not genes or lifestyle, say scientists”, a headline trumpeted by The Telegraph was a great start, backed-up by much the same parroted in The Independent and The Guardian. The only good news was that, try as I did, I could find no equivalent coverage in The New York Times or The Sydney Morning Herald. Let’s hear it for the colonials – or at least their science editors! Why is it that this sort of journalism so annoys and certainly did so on further reading of those new year contributions? Well, partly because it’s headline-driven rather than a thoughtful effort to inform the public. And then because what’s propagated isn’t totally wrong – that would be easy to deal with – but rather it’s a confused mish-mash of half-truths guaranteed to confuse utterly anyone who doesn’t have an assured grip on their molecular wits. First let’s get the basic picture clear, then see what “the scientists” really said in this new piece of work and finally illustrate how the Gentlemen (and Gentlewomen) of the Press get me so incensed. Asked to sketch a current cancer portrait one might say: Cancers are caused by damage to DNA, i.e. mutations. Of our 20,000 or so genes several hundred can acquire mutations that change the activity of the proteins they encode to contribute to cancer development. Only a small number (half a dozen or so) of these ‘driver’ mutations, acting together, are required for cancer to emerge. Thus almost limitless combinations of drivers can arise. The effect of these cancer ‘drivers’ is to make cells proliferate (i.e. divide to make more cells) either at a faster rate than normal, or at the wrong time or in an abnormal place. Environmental factors (e.g., smoking) can increase the mutation rate and hence the chance that cancers will evolve. Most mutations accumulate during the lifetime of the individual (hence most cancers are ‘diseases of old age’). However, about 10% of cancers are started by inherited mutations (that the patient is born with), with further mutations being acquired after birth. We should also bear in mind that collectively cancer comprise about 200 distinct diseases and that at the level of DNA sequence every tumour is unique. Cancer cells dividing. Photograph: Visuals Unlimited, Inc./Dr. Stanley Flegler. The work that the journalists caught on to didn’t describe any new experiments but instead looked at the long-standing puzzle of why cancers, although able to arise anywhere in the body, have a strong tissue bias. For example, tumours are twenty times more common in the large intestine than in the small intestine. Noting that within many tissues most cells are short-lived and don’t give rise to progeny (and so are unlikely to initiate a tumour), the authors focused on the cells that can self-renew and are therefore responsible for the continued existence and repopulation of the tissue (often called stem cells). Searching the literature, they found 31 tissue types for which it was possible to work out how many stem cell divisions occur in an average human lifetime. Lo and behold, it turned out that the number of divisions correlated quite well with the lifetime risk for cancer in that tissue type i.e. the more replications of stem cells that a tissue requires over its lifetime to sustain its functional, the greater the risk of a tumour emerging in that tissue. An interpretation of this is that the majority of cancers arise (i.e. are started) as a result of random mutations occurring during DNA replication in normal, non-cancerous cells. The underlying point here is that every time one cell makes two it must first duplicate its genetic material (i.e. replicate its DNA). This process is amazingly efficient but it’s not perfect (cells make a mistake once for every one thousand million coding units (i.e. bases) incorporated into new DNA). In the abstract of their paper the authors describe cancers initiated by these naturally occurring mutations as “bad luck” – unfortunately in my view, as the expression was a sure-fire red rag to the press bulls. NO IT HASN’T. Do you not read what you’ve written and consider how it might come across to readers who think they’ve grasped the basic picture, as summarized above under Let’s get things clear? What the study confirms is that the major force behind cancers is the accumulation of mutations (defective DNA if you wish) as cells replicate during the lifetime of the individual. To the risk of getting cancers posed by this background to life may be added environmental factors that promote DNA damage and inherited variants in DNA (see A Taxing Inheritance for more about parental contributions). Well, it’s marginal and certainly not enough to merit the above headlines. The new work doesn’t alter in any way our summary. However, it’s interesting in that it offers an explanation for the wide variation in cancer incidence across different tissues and makes the point, for instance, that the relatively high rate of cell renewal in the lung makes this organ particularly susceptible to the mutagenic effects of cigarette smoke. First we remain as we were: cancers are a fact of life – they’re hard-wired into the biology of life and they’ll come to all of us if we live long enough. It is certainly true that there are many cancer patients who have had bad luck. They may have always eaten healthily, kept active and physically fit and been teetotal since birth and yet be stricken by, for example, a brain tumour or pancreatic cancer for which there are no known environmental risk factors that we can do anything about. They may have never smoked but nonetheless develop lung cancer (think of Roy Castle). But it remains the case that for many cancers, it isn’t just about luck, it’s about choices, both for society and for individuals. Mention of environmental factors reminds us that mankind really isn’t doing very well on the self-help front. Eliminating smoking would reduce the global cancer burden (14 million new cases, over 8 million deaths per year) by about 22%. Infections, for example from contaminated drinking water, start about 20% of all cancers whilst alcohol consumption has a hand in about 4% and in the UK over 20% of bowel cancers are linked to eating red and processed meat. I know that for all the effect my wittering about the quality of science journalism will have I might as well get on to the sports pages. I actually have some sympathy with the Gentlemen of the Press: writing about science is difficult – perhaps we should rejoice that there’s any national coverage. But there is a recurrent problem in the British press (see Not another ‘Great Cancer Breakthrough’!!!) that can easily be avoided. Just report evolving science stories as precisely and clearly as possible. They’re often sensational tales in their own right, so leave the sensationalism to the other pages and tell it as it is. Rant over. Happy new year. Now, where’s the marmalade? Tomasetti, C. and Vogelstein, B. (2015). Variation in cancer risk among tissues can be explained by the number of stem cell divisions. Science 347, 78-81. I always hesitate to say things like ‘you may recall’ as, from much undergraduate teaching, I’ve learned that blithe throwaways like ‘you’ll remember this from last Monday’s lecture’ tend to be met with blank stares and trying ‘you met this idea in the first year’ on second year classes will draw forth outright mirth blending with mutinous howls. So let’s just start by noting that three weeks ago in Our Inner Self we had a march-past of our intestinal army of bacteria and saw that it is in continuous flux, its make-up oscillating in time to our biological clock – the daily variation that governs most of our bodily functions including the sleep-wake cycle. That’s amazing stuff but a sharp bit of lateral thinking raises interesting questions. If most of the important things in our bodies tick to circadian rhythms, is cell proliferation one of them – after all, the process of cells making more of themselves is at the heart of life. Answer ‘yes.’ But, as abnormal cell proliferation – i.e. something going wrong – is a perfectly adequate three-word definition of cancer, a small step extends the question to ‘do tumours also have rhythm?’ Answer, again, ‘yes.’ A little background before we explain. In Twenty more winks we saw that there’s a connection between sleep (or rather lack of it) and cancer and showed how two pairs of genes (CRY/PER and CLOCK/BMAL1) lie at the core of circadian timekeeping. They control the sleep-wake cycle and much else. The proteins they make form an orchestrated feedback loop, synchronised by light-induced signalling. That is, the expression of each pair oscillates with a period of roughly 24 hours, but the pairs are out of step to the tune of about 12 hours. The proteins encoded by these genes regulate the expression of many other genes that ensure the cells and tissues of the body beat to an appropriate rhythm. Many messengers spread circadian oscillations around the body via the blood of which, in humans, cortisol (made by the adrenal glands) is perhaps the most familiar (it’s a steroid hormone: the medication dexamethasone is cortisol with two small, extra bits that make it 25 times more potent). You can fairly easily measure cortisol concentration in blood and you’d expect to find that at nine in the morning you’d have roughly double your midnight amount. In other words cortisol is part of your wake-up call. It turns on your appetite, gets you geared up for physical activity and it also activates anti-stress and anti-inflammatory signal pathways. Cross-talk between EGFR and cortisol during the active phase (right: high cortisol) and the resting phase (left: low cortisol). (from Lauriola et al., 2014). Taking the memory-prodding risk yet again, in Mission Impossible? we described how biological signals from the outside world bind to receptors (proteins) to convey their message (I’m here, do something!) to the interior of cells. So the picture is: cells receive many signals from messengers that, one way or another, talk to the nucleus, switching on genes that drive proliferation. Most external messengers are proteins themselves – one example is a potent growth promoter called epidermal growth factor (EGF) that works by switching on the EGF receptor (EGFR). Cortisol isn’t a protein: as we’ve noted, it’s a steroid – which means it can diffuse across membranes – but, once inside a cell it works in essentially the same way, by binding to its specific receptor. The upshot of all this is that messengers transmit information from outside the cell to the nucleus – where DNA lives, the cells’ repository of genetic material – so that genes become activated to produce proteins. The picture of multiple, linear signalling pathways co-existing within cells invites the idea that their protein components might be unable to resist tapping in to their neighbours’ conversations – and so it has turned out. However, for pathways like the EGFR that signal cell growth, cross-talk with cortisol signalling is more than merely listening in. 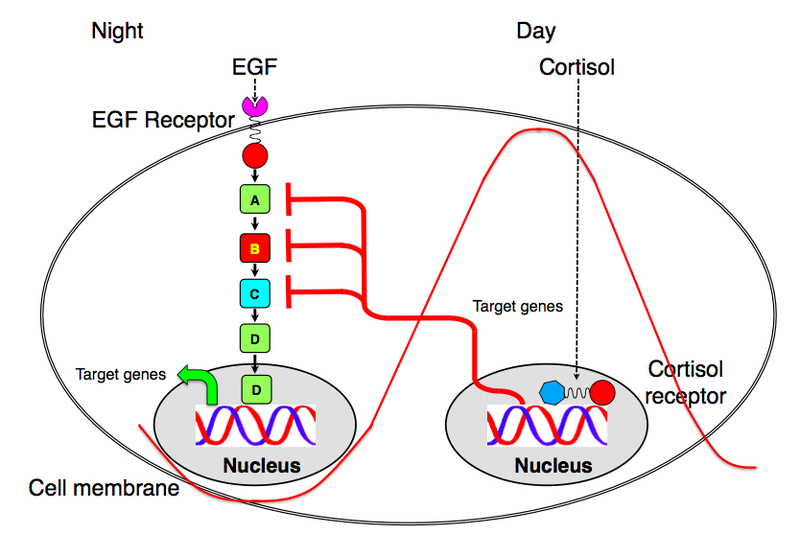 Proteins activated by the steroid hormone can actually interfere with the relays in the EGFR pathway so that EGF signals are suppressed during the active phase (day-time in us, night-time in rodents) but enhanced during the resting phase. So growth signaling is under circadian control – by and large our cells do their multiplying when we are at rest. Interesting although perhaps not unexpected. But, as The Bonzo Dog Doo-Dah Band warbled, ‘here comes the twist’ (Urban Spaceman, 1968 if you’re struggling). These pathways are the very ones that are hyper-activated (i.e. mutated) to drive cancer cells to make more of themselves and they are, accordingly, the targets for many anti-cancer drugs. However, chemotherapy is usually administered as single bursts, at daily or longer intervals, and drugs are progressively removed by metabolism thereafter. This means that much of the impact may be lost if, when the drug concentration is at its highest, the target pathway is already suppressed by high glucocorticoids . There’s evidence consistent with this idea from animals bearing EGFR-driven tumours treated with specific inhibitors that are more effective if administered in the resting phase rather than in the active phase. So two new messages are now making themselves heard in the world of cancer biology. The first is beginning to tell the full story of clock complexity. The second takes up this theme by pointing out that a circadian clock-based model in cancer therapy may offer improved methods for prevention and treatment. Lauriola, M. et al. Diurnal suppression of EGFR signalling by glucocorticoids and implications for tumour progression and treatment. Nat. Commun. 5:5073 doi: 10.1038/ncomms6073 (2014).